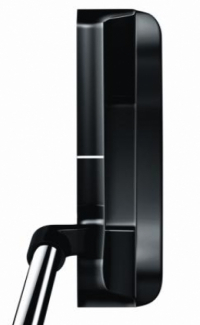 Available in: 33", 34", 35" - right and left hand. Briefly: A handsome putter whose insert gives a nice click a impact. A Perfect Blend of Friction and Feel…it’s how we roll. New Metal-X Putters represent the latest chapter in Odyssey’s long history of game-changing innovations. The Metal-X Insert provides the crisp feedback of a metal striking force, coupled with amazing feel. The unique face pattern generates the truest roll in golf and the ovals on the face develop a mechanical lock with the golf ball’s dimples at impact, creating friction and imparting an incredibly consistent roll for high precision distance control. Dual-layered insert designed to put a consistent, true roll on the ball with amazing feedback and feel. The 6061 aluminum striking layer’s oval depressions maximize the mechanical lock with the golf ball dimples to increase friction and impart proper launch of the golf ball, which in turn creates a much more controlled and consistent roll. The Urethane inner layer provides soft touch and saves weight to optimize performance. Premium, high tech process produces a durable, glare reduction finish. This finish was added specifically based on feedback gathered from Tour players. Thin, smaller pistol shape appeals to better players. The grip is made of Lamkin’s proprietary 3GEN material, which is their softest synthetic rubber compound and reduces vibration without dulling the feel of the putt. This allows golfers to keep their forearms relaxed, apply very light grip pressure and minimize hard tension for smooth, consistent strokes. We design each of our putters to help you slay more demons and sink more putts. But we also design them to withstand any kind of punishment you can dish out and we back them up with an Odyssey assurance of quality. We rarely see a putter returned, but if you find a defect within a two-year period, we'll repair it or replace it. No questions asked. 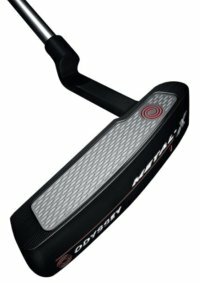 By awarding this putter 10 for performance, you might run away with the idea I've holed every single putt I've ever hit with the Metal-X. Nothing could be further from the truth. I've missed plenty. It's very difficult to evaluate a putter. Ben Crenshaw would hole out on the greens more often than me if he were using a lamb chop tied to the end of a ski pole and I had something fitted specifically for me by the world's most accomplished club-fitter. Does that make the ski pole/lamb chop implement better than a modern putter? Perhps more importantly, how many more putts would Crenshaw hole if he were using a $300 model with bells and whistles as opposed to the old Wilson 8802 he has favored for so long? Plus, as one very highly-rated instructor told me at the weekend, you can have the most perfect stroke and the very finest putter available, but if you can't read a green and start the ball on the correct line you will never hole a putt. After nearly two decades using a putter with no insert, hitting one with any insert be it plastic, rubber, ceramic, or metal was bound to feel odd. I've tried putters with soft urethane inserts and found I rarely get the ball to the hole. They're too soft and transfer insufficient energy for my taste. But after three rounds and a good deal of carpet putting, I'd say I've grown to like the Metal-X. It gives a nice click rather than the soft thump of a plastic insert. That said, while I really began to like the Metal-X on the greens at Semiahmoo two weeks ago, I never could get the pace right on the slightly firmer, quicker greens at Broadmoor GC in Seattle three days later. For now, the grip is slightly too thick and the putter slightly too heavy for me to get comfortable on really quick surfaces. But the #1 looks fantastic and sets up beautifully. The white line atop the face is all most people need to help them align correctly, and the black finish looks good and reduces glare. The bottom line, though, is whether or not it will enable me to hole more putts. Only time will tell, but at least I'm safe in the knowledge that if (or rather when) I do miss, it won't be the putter's fault. Knowing you have a top-of-the-line, technologically-advanced putter in your hands can do wonders for your confidence.